Apportez à la maison de nouvelles techniques de cuisine et quelques recettes de Milan en prenant cet excitant cours de cuisine. Apprenez à un chef professionnel comment préparer quelques spécialités et spécialités milanaises tout en apprenant à préparer un repas de quatre plats composé de risotto, gnocchi, raviolis, tiramisu et panna cotta, à partir d'ingrédients frais et de saison achetés sur un marché local . Quand vous avez fini de cuisiner, asseyez-vous et profitez du repas, complété par du vin produit localement. Les participants sont limités à six personnes, ce qui garantit au chef une attention personnalisée. Commencez votre cours de cuisine en discutant du menu du jour en sirotant un thé ou un café avec le chef et les autres gourmands. Le cours de cuisine à Milan a lieu dans la maison privée du chef Clara sur la Piazza VI Febbraio, où vous apprendrez de nouvelles techniques de cuisine et les secrets de ce qui rend la cuisine de Milan si délicieuse. Préparez quatre plats traditionnels, le menu en fonction de la saison. Tous les ingrédients sont achetés sur le marché local. Commencez à préparer le plat, qui sera composé de risotto, de pâtes ou de gnocchi maison. Ensuite, passez au deuxième plat, un cœur de viande ou de légume, tel que l’ossobuco (veau braisé), la saltimbocca (veau et prosciutto) ou une frittata. Complétez votre repas italien classique avec un dessert tel que tiramisu, gelato, panna cotta, gâteau aux fruits ou gâteau au chocolat. Lorsque tout le repas est terminé, la phase savoureuse commence: placez-vous sur une chaise et laissez-vous tenter par votre repas de quatre plats. Sirotez un vin qui a été sélectionné pour compléter la nourriture que vous mangez. À la fin du repas, obtenez un avantage supplémentaire avec un coup d’espresso italien. Ensuite, quittez la maison du chef avec un livret des recettes que vous avez préparées ce jour-là, ainsi qu'un certificat attestant de votre participation au cours. This class was amazing! Clara was very knowledgeable, helpful and hospitable! Loved the whole experience! Clara's Cook in Milan was a BIG highlight of our stay in Milan. We are 2 couples who were joined by 2 others to make-up an intimate cooking class in Clara's kitchen in Milan. Clara is a delightful instructor who gave us tips on how to cook Italian food along with the proper techniques in a 4 hour class that we will definitely recreate in our own kitchens at home. In our class we made Crespelle a crepe wrap with cheese, ham and sauce. Gnocchi al Ragout potatoe dumplings with bolognaise sauce, Risotto al pesto e Gamberi Italian rice with shrimp and basil sauce, and Tortino di Cioccolato Caldo hot chocolate lava cake. We totally were hands on in preparing each dish and also in getting to consume and taste our accomplishments at the end of the class. With Clara's expertise and training, the dishes we prepared were fantastic. This is definitely a must to do if you have a free morning in the city. Would love to return and take a second class! My wife and I took a class with Clara and it was fantastic. The cooking and preparation tips she provided on all four courses were so easy to follow. Clara herself is personable, fun and she gave full attention and help to all 7 of us participating in the class. The recipes we made were some of Clara's grandmas recipes and they turned out great. My wife is a self professed Gnocchi hater and she loved the Gnocchi we made. The best part is sitting around enjoying the fruits of your labor with some perfectly paired wine Clara is not only Le Cordon Blue certified but also a Sommelier. If our future plans call for a trip to Milan, we will definitely look at taking another class from Clara. Bucket List item checked! I had so much fun cooking with Chef Clara as well as meeting people from all over the world! It was amazing experience in my life. Clara is professional and friendly to everyone. it is not too difficult processing for beginner and I have a lot of fun with it. worth to try if you are love Italian food. Clara is a trained Cordon Bleu chef. So this is more than just a cooking class. It is an experience. We had such a wonderful time. We learned to cook traditional Milanese cuisine and it was presented to us in a manner that made it very achievable for the typical cook. We met some wonderful new friends and just had a truly great time. Sitting down together to eat our meal was memorable. This is one of the top experiences that we had while in Italy. Thank you for opening your home and kitchen Clara! Lots of fun learning about Italian cuisine and enjoying the company of other food lovers from around the world. Thanks! When we were in Milano, I searched for a vegetarian Italian cooking class that was taught in English. This class was a perfect fit. Clara was a consummate teacher. She distributed recipe books and discussed what we would be preparing. We washed our hands and were welcomed into her kitchen. She explained what she was doing and why. There were plenty of laughs while we were learning. Clara also shared information that will be useful when we buy Italian food and wine in the States. After the food was prepared, we all sat down at a beautifully set table to enjoy our homemade meal. Connecting with a native while you're traveling always is such a treat. Clara made our trip to Milano very special! 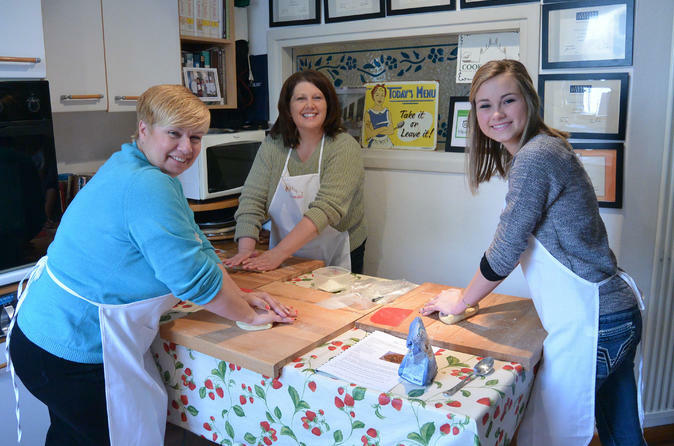 We had a fantastic time at Clara's cooking class! It was great to meet and learn alongside fellow food-enthusiasts from all over the world. Clara gave us lots of information about the best ingredients and where to buy them, and guided us through cooking a delicious meal! The class was well paced, there was plenty of time to take pictures and make notes, and we got some great hints and tips for cooking traditional Italian recipes. 5 We would definitely recommend Cook in Milano! When booking your trip to Milan and Northern Italy, this is a must do, right up there with the Duomo I'm 100 serious. I booked the class based on the reviews and the value, it really is a steal for a four course meal, paired with wine. On top of that you have excellent conversation and memories that are priceless. It was a small class, just my wife and I and another woman. We were staying near Milano Centrale and took a beautiful 45 minute walk to Clara's house train would be easier but we wanted to experience as much of the city as possible. Clara is so welcoming we felt like we were going to see a life long friend that lives in Milan. I'm a pretty experienced cook and my wife enjoys cooking. We both learned so much from Clara. My wife and I have talked since the class that we've watched Italian Cooking Shows Mario Batali, others but we could never connect to them. They share very real experiences, and recipes they've had in Italy, etc but the point is those stories and recipes were THEIR experience, not ours. Sort of like how when you show people pictures of the Alps and they say way, but they truly can't appreciate the magnitude and beauty of actually being there. Now we have this lovely experience of being in Milan, in a beautiful home, with a great friend learning new recipes and old techniques. These are OUR memories now and when we see Scamorza, or other things we made and used in the class... We will always remember being with Clara in her kitchen and how magical it was. It will inspire my cooking the rest of my life and now I can tell stories and recipes to friends when we are entertaining, and yes they won't be able to connect unless they go meet Clara, but I'll be so fond of our time in Italy and with Clara that I'll make them listen anyway, and maybe inspire them to go! Clara and the class to us was as authentic Italian as it gets and that's why I say it is a must do along with things like the Duomo. You are short changing your experience of visiting Italy, learning the culture and the beautiful people if all you know of its food are the tourist focused restaurants on the main drag. Clara is so professional and you will have much to learn regardless of if you've never cooked or are an experienced cook like myself. Thank you so much Clara for such a great time. We'll be coming back to Milan one day and can't wait to take another class!